Earlier this month, one of my favorite new blogging friends,Shannon at Bless Our Nest, passed on this sweet award. She considered my blog a “must see,” and that touched my heart because if anyone’s site is a “must see” – it’s hers. Thanks so much, Shannon. This was also a perfect opportunity to thank her (or maybe scold her) because she got me started on a great new hunt………..
And wow, have I been enjoying the start of a new collection. another one of my daily reads. I had lots of sweet things to say about Stacey, but do you hear me screaming,”NO,” all the way from NC? 30 minutes of my work on this post just got deleted, and I having to re-do it!!! UGH! BLOGGER!! Ok, deep breath…I am much better, thank you. Just forget any eloquent sentence structure…it’s out the window. I think the gist of my intent was to express that Stacey has a heart for hospitality and home making that matches my own. Being such a ‘professional’ thrifter/yard saler, it has been a blast to be on the hunt for something new….and am I ever hunting. I think of all the sets that I have probably passed over in my many years, but ALAS, a new day has dawned, and wait till you see what I have found in such a short time. 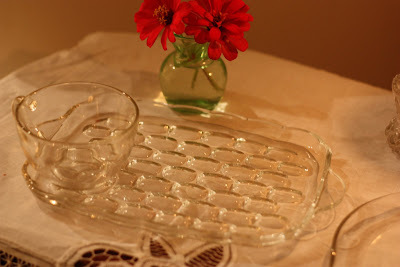 Here are Stacey’s….they work great for milk & cookies! She uses them for LOTS of parties and get-togethers. They are perfect to hold on your lap. Below she used the plates only (under the fan) for the goodies at her daughter’s birthday tea party! 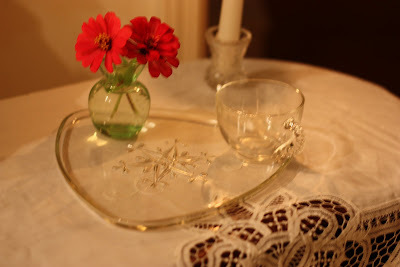 Here’s a close up of one of the sets that she found. It looks like 2 flowers stuck together, and she got them for just .75 each…..20 sets. 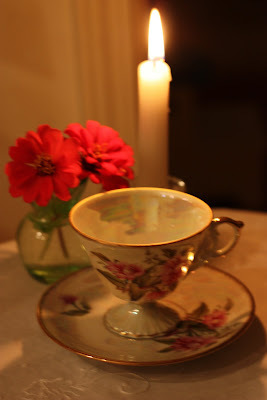 I haven’t really mentioned or done a post yet about my tea collection, but I do have an extensive collection of tea cups, saucers and teapots….lace tablecloths, candle holders…all the goodies to put together for a magical time together. The only problem….I don’t like tea. I have tried, really….I even went to school in England, but coffee is my queen, and she looks beautiful in these cups, as well. The reason I bring up that fact is that deep, deep down, I adore unique dishes. 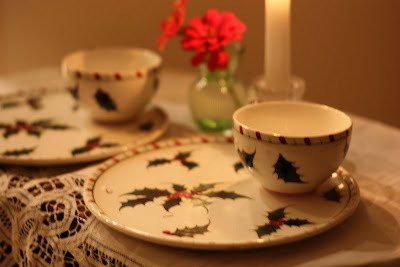 I had already purchased these luncheon sets ….plates and saucers, but in a Christmas style. Yes, it’s so fun to have a new “eye candy” camera, but I don’t know how to use it yet. I took these at midnight when my hubby was already asleep. My 13 year old is sitting here explaining to me what I did wrong last night, and why this particular pictures is blurry… I refuse to retake it, ladies…sorry. But just think….you will all be able to watch my evolution as a photographer….just you wait. I am a woman who loves to learn and a fire has been lit. I found six each of the next two sets….they will be fabulous for fall. All of them were under .75-$1.50. I found another six of these for $1. to pull out our finery. My most prized processions are found right here under my own roof in the form of five lively little hoodlums, so why “wait” for the right time? These plates proudly proclaim that they have served soda and Doritoes, milk and Pillsbury toaster strudels, juice and stale toast, and just this morning…..hmmmm…..I’ll savor it in silence. In a few minutes, a mundane moment can become monumental….give it a try. Doritos by candlelight? It’s the best. Bedlam moment? It’s 1 am….what am I thinking? Don’t play Russian roulette with caffeine late at night. 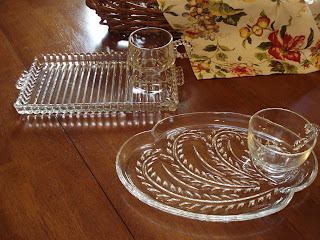 My Nana had several sets of the square luncheon plates; I wish I still had them I would send some your way! Oh that is soooo cool! I love this dish idea. You are just too sweet to mention me. 🙂 You are on your way and it is so much fun! I LOVE those sets and have seen the collecions of them…they are GREAT!!! Jen, your enthusiasm is so cute! I love those little luncheon sets. I haven't seen these around in years, so how fun to start a new collection of them. I'm SO glad to see you younger girls loving homemaking & feathering your nests for your families. It's not a lost art after all, but alive and well in blogland! 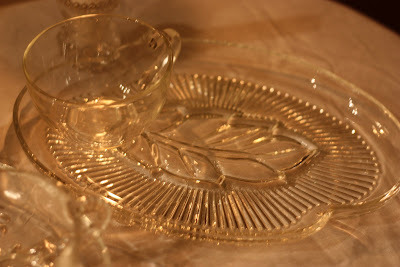 My grandmother had sets of those luncheon plates – how I wish I had them now. Your luncheon sets are beautiful and I hope you post about your teacups in the future. Have a great weekend. I am in NC (Triad to be kind of exact) and have recently began reading your blog and enjoying it! I esp. want to thank you for the heads up about HT coupon tripling last week. . . I saved $40 as someone who never clipped coupons before! I love those sets. I only have a few but they are so nice to use. I love, love, love, your dishes! 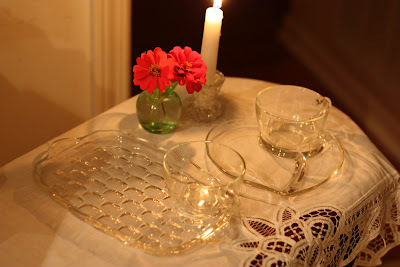 I enjoyed your blog all about the pretty party dishes. Take care. This is a special posting for me! 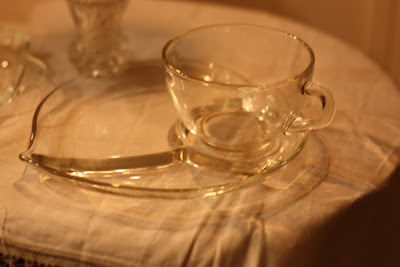 Seven years ago I was in a antique shop that was selling those plates with the glass cup that goes with it. 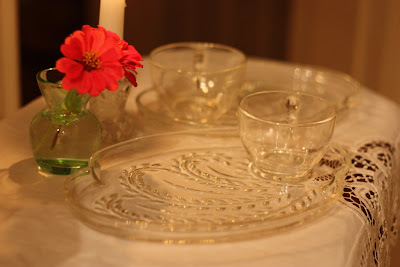 As a child, I remember my grandmother serving me my lunch on plates like that from my great grandmother. She would cut off the crust..use this special bread…make egg salad with chopped up pickles! So when I saw it…I bought them all! I love them! I did not see any blurry pictures…they all looked beautiful! Wish you lived closer so we could have a non-tea party and use your pretty collections! Thank you for sharing you glassware. Its so fun to collect. I have I been collecting for seven years and have almost 12 piece set and extra pieces. Your set I never seen and I been all over southeast stores. Have fun adding to your set. I love the flower one. I have not seen one like that! Beautiful collection going on there. I have to agree that you are my must see blog. I am so enjoying your thrifty blog posts and I will be trying out CVS for the first time ever, this next week. I love your pretty sets!!! I love those luncheon sets. That reminds me long time ago a gentlemen gave me a couple sets. I need to drag them out and actually use them. Thanks for the reminder. Where do all of you store these beauties? I just don’t have the room! I got my CVS card in the mail today! I have to get started!!!! Any other tips you can give? I have a set of 8 of these. I never knew they came in such a variety of shapes and sizes. What a fun thing to collect. I love it that you USE them. Too often we don’t use our special things. What?!! Who won? Sneaky girl :)!! I love your sets! So beautiful–it’s amazingly fun to collect these, isn’t it? I am loving the ones with the leaf in the middle, so great for fall. And the others are lovely as well! Good for you for using them too, and not saving them for “special” occasions only. Actually, anytime you use something for your family is special, isn’t it?! OOH< I have several sets of four of the ones in the first picture, and I have one set of six of the ones with the grapes. I love to haul them out for "tea parties" where we don't drink tea. They make people feel special. I have NEVER seen any of the other styles, though. Cool. I was just looking at a set of these the other day. My fleatique was selling a set of 7 or 8 for about $1 each. I nearly snapped them up because I saw Shannon’s post too and thought they would be so much fun. I love , love, love luncheon sets!! These are adorable. They make everything so fancy and fun. PS We sold ALL our bread at the Farmer’s Market today!!! It was a success. I absolutely love luncheon sets! I have some too, but not nearly so many as you! You have a beautiful collection. Oh look at all those pretties! Don’t you just love it when you find something that makes your heart beat a little faster. I love those sets! I’ve been looking for ones that have a soup bowl but no luck!